Trails for hiking, mountain biking, and equestrian use lead visitors through an astonishing variety of habitat types. Notable park features include Towsley Creek, and spectacular water-worn rock formations in Towsley Gorge, as wells as scenic trail viewpoints and oak woodland. Sonia Thompson Nature Center features exhibits about the natural and cultural history of the park. All of the trails in the park can be visited easily within a normal patrol time period. 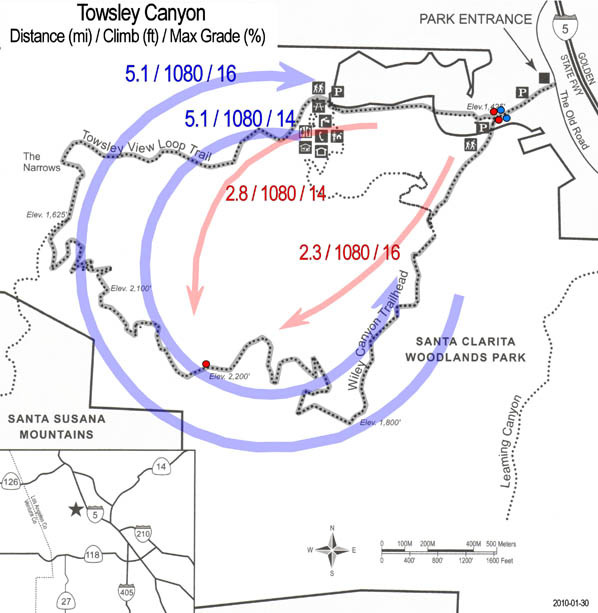 Those looking for slopes that are more gradual should stick to the Towsley and Wiley Canyon areas. The parking lots at the front of the park, as well as Ed Davis Park and the lawn area surrounding the nature center, are excellent places for visitor interaction. The park is bordered on the north Towsley Canyon and on the south by Wiley Canyon, with connecting multi-use trails at the rear and middle of the park. Natural oil that seeps throughout the area originally attracted Tataviam Indians: the Towsley family settled the area at the close of the Civil War and later sold the land to the company that eventually became Standard Oil. The seeps are still active and can be seen in several locations in the park. There are approximately five and a half mile of trails.